Fans of Fruits ‘n Sevens, Golden Sevens and Garden of Riches will really enjoy this classic-style slot game. With characteristic slot-style music and sound effects and standard, well-loved symbols, Jolly Fruits might seem like a typical, boring slot at first – but we assure you it isn’t, and this is made clear by its not one, but two progressive jackpots! 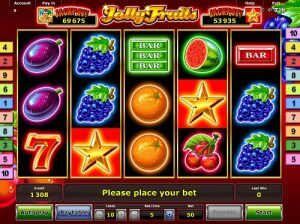 With 5 reels and 10 paylines, Jolly Fruits is a great game for beginners who are looking for a jackpot slot that isn’t too complicated, or high-rolling experts who want something a little more old-school and fun! With some slots these days getting a bit fussy and over-complicated, it can sometimes be quite difficult to differentiate between similar symbols – which is especially annoying when you’re trying to stop the reels in your favour! With Jolly Fruits, you don’t have to worry about any confusion. All of the familiar symbols are there, such as: oranges, lemons, cherries, watermelon, bars, stars and sevens, and they’re all brightly coloured and classically designed. The jolly joker is the Wild symbol and he substitutes for all other symbols except the Scatter, which is the golden star. Jolly Fruits is a really easy game to understand, which is why it’s perfect for beginners. At the bottom of the screen, you’ll find your bet amount displayed clearly in the middle; your balance on the left and your last win on the right. It’s simple to change your bet, and all you have to do is use the plus and minus symbols to alter how much you wish to bet on each of the 10 paylines. The paytable is there to help you and you can check it whenever you like to see how much each symbol will pay you according to your bet amount. The aim of Jolly Fruits is to spin three or more matching symbols, in a winning combination, across a payline. As with most other NovomaticCasino.co.uk slot games, you can play for fun until you’re ready to play for real. Once you’ve got the hang of the game, you can set the game to ‘autoplay’ mode and watch as the reels spin for you without you having to do a thing. What’s more, Jolly Fruits has a classic double-or-nothing gamble feature, which enables players to turn even the smallest of wins into something much, much bigger! Be careful though, whilst you can double, quadruple or octuple your win, you can also lose it and be sent back to the reels with nothing! That’s right: Jolly Fruits has not one but two jackpots up for grabs! They’re progressive as well, which means they grow bigger and bigger the more you play. To win the minor jackpot, called the ‘star jackpot’, all you have to do is spin 5 star Scatter symbols across reels! To win the major jackpot, you’ll need to spin 5 jolly joker Wild symbols in a winning payline. The Rest of NovomaticCasino.co.uk is Jolly Too! Here at NovomaticCasino.co.uk, we have plenty of other games to choose from. Our selection of slots and video slots is immense and we also have some great table games, such as: Multiball Roulette, Royal Crown 3 Card Brag and Sic Bo. Our live dealer games, such as: Live Blackjack and Liver Baccarat, are brought to you using the very latest technology and will no doubt make you feel as though you could be sitting at a table in the world’s most glamourous casino!